Barren sandbars can be used to grow crops such as pumpkins by filling pits with household compost. Every year, monsoon rains cause the three major rivers of Bangladesh, the Ganges, Brahmaputra and Meghna to swell, resulting in devastating floods. These wash away fertile land and destroy homes and livelihoods. Each year, hundreds of families are forced to find a new place to live and a new means of earning a living without land to cultivate. Sandbars emerge as the rivers recede, but the ‘char’ – the silted sand plains that the floods leave behind – are too infertile for even the most skilled farmer to tend. But the barren soil can be made productive again by using the technique of pit cultivation for pumpkins and other crops. Practical Action worked with farmers to develop a simple and effective solution. Thousands and thousands of holes. Each no more than a metre across, dug into the sand bars, then filled with compost. Into these, farmers are able to plant seeds; from which can grow crops that the families can eat, store, even sell to make money. They can then put this money towards medicine, clothes, livestock or schooling for their children. Mozahar Ali describes the impact that sandbar cropping has had on his family and livelihood. Watch this video of Kate Thornton talking about her visit to Bangladesh in July 2016 to find out how the Pumpkins Against Poverty appeal has made a difference to people's lives. Last year Anwar produced 600 pumpkins. After selling 450, he had enough to feed his family as pumpkins can be stored for over a year. With the income, he bought a cow and some chickens and can now afford to educate his children. They have a secure home and he is passing on his knowledge to others. In Bangladesh, families whose homes and land have been washed away in the monsoon rains, face months of hunger and malnutrition. Donate now A pumpkin can provide a nutritious, year round supply of food - and can be grown in the sandy, barren soil left behind when flood waters recede. It’s a practical solution to poverty. 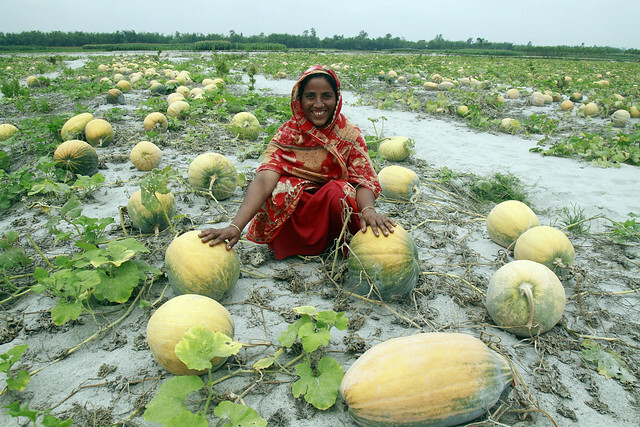 The Pumpkins Against Poverty appeal improved the lives of 50,000 landless people in Bangladesh through training, sowing, a bumper harvest, and crop diversity, as well as many other benefits. You can also read more about our past work transforming barren sandbars in Bangladesh as part of the Pathways from Poverty (Shiree) project, which won a St Andrews Prize for the Environment. This technical brief describes a way of growing crops on the sandbars, created by river deposits in Bangladesh, and how this can be used to increase crop production for marginalised farmers. This document describes pumpkin production in sandbar with the support of SHIREE project Pathways From Poverty Project in four erosion-prone districts of North-west Bangladesh.